On 2nd June 1952 at the Sunderland track, Joe Riding of the Blackpool Club set a 1/4mile record of 115.83mph with his Rowell engined car. This remains to this day, the fastest speed ever recorded by a British car and motor. 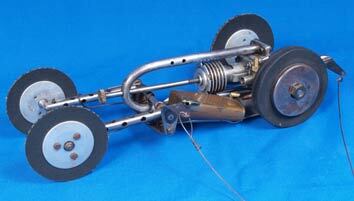 The motor was an amalgam of MKI and MKII Rowell parts while the car was based on a Rowell Sabre pan. The record had been held for several years by Gerry Buck with 'Topsy'. This represents the pinnacle of development of the all British tethered car. 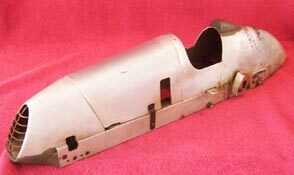 Dating from the early 1950s, the bobtail chassis is fitted with a close coupled Rowell MKII motor. The 'pan handle' tether connection was universal by then, but the GRP body must have been a very early example of the use of this material. This configuration of car still holds the record for the highest speed with an all British car. This car was seemingly built without any reference to plans of any sort. The front axle and gearbox is slotted into the frames and driven through a normal centrifugal clutch. Wheels and tyres are an assortment, while the ignition system and wiring are a trifle agricultural as well. It seems that the GHQ motor lurking beneath the removable bonnet was the most desirable part of the car as it has changed hands four times in almost as many years. Update May 2012: Now known to have been one of the cars built by Mr R.G. Cameron of Gatehouse-In-Fleet, Kirkcudbrightshire. 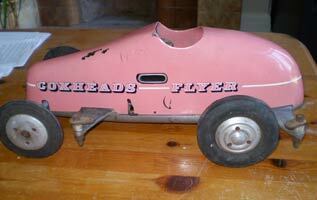 From Australia came the enquiry at to whether we had any ideas about this car. 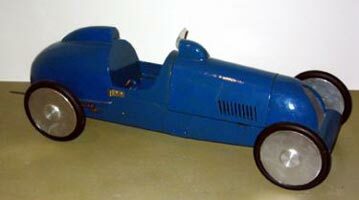 That it is a model of a Cooper Bristol and a very well made scale model was evident, but there was a niggling suspicion that there might be more to it than that. 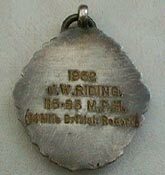 Another batch of photos confirmed that this was another example of the fine work produced by Arthur Weaver. For more details of this car and other work from the 'North London Maestro', go to our Weaver 'Pitbox Special'. 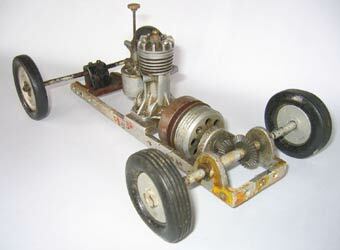 This is a lovely example of the car designed by 'Formula' and described as a constructional article by Capt Stubbs in the Model Car Manual. 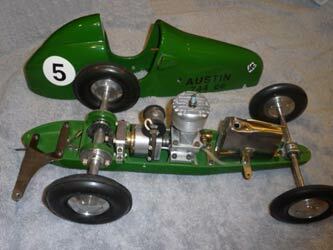 The semi-scale design is based loosely on the GP Austin, although everything about it is typical for a tethered car of the period. Stubbs made patterns for the pan and had them cast up locally and a similar one was available from Warren and Clarke with cast tether brackets. This is an original type pan with bolted on tether brackets and follows the plan almost exactly, except the tank is for CW running while the car is set up for ACW. 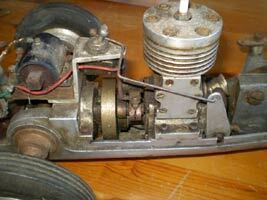 The Hornet motor with a magneto did away with the need for all the ignition components on the original. Very well made, but by whom? Rowell wheels and a Warren & Clarke pan provide the basis for this very well engineered car. The engine is entirely home built showing the level of craftsmanship evident in this lovely car. The only problem is that so far we do not have a clue who was responsible for it. This wonderful car has not been touched, making it a perfect 'loft find'. Sold on ebay for £1220, Feb 2011. So far this sideport engine has eluded all attempts to identify it. From the complexity and quality of the castings it looks as if it should be commercial, but what? 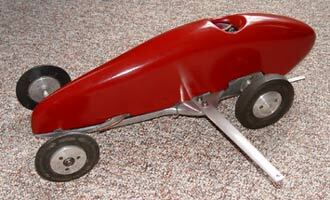 The chassis looks a lot of work if cut from plate but has an almost cast look. The owner is in Australia, which may give a clue to its origins. Getting the support bearing to line up with the engine mounts looks an interesting job. Any thoughts on the motor or chassis would be much appreciated. 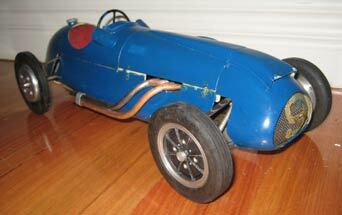 The Alton Special was designed by Phil Smith around 1947 and kitted by Veron, one of Guy Rickard's companies. The Rickard's lived at Beech, just outside Alton, hence the name. 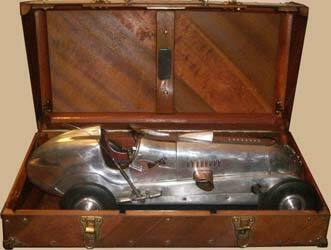 The car was all wood and intended for the 6cc Stentor using components from 'Replica Ltd', of Sloane Street London, another of Rickard's companies. 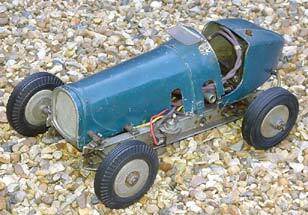 The kit alone was £3-3-0 and it was claimed that the car had been tested at over 60mph. Original versions of this car are very rare. The world's most expensive tethered car? We reported the sale of this Korn Indianapolis in November 2008 when it made $21,100, something over £15,000 at today's rate of exchange. It had no real provenance other than a suggestion that it might have been owned by Barney Korn's wife Annemarie. We have recently obtained this picture to show exactly what the purchaser got for their money.